Hydra School Projects is an annual art exhibition, now in its tenth year, curated by Dimitris Antonitsis and housed in the historic Sachtoureion, the old Hydra High School that used to function as a sea captain’s house. Each year Hydra School Projects brings together a select group of established and emerging contemporary and international artists to fill the building’s former classrooms. Especially conceived to celebrate the 10 years of Hydra School Projects, an art walk was organized in public and private spaces of Hydra island. 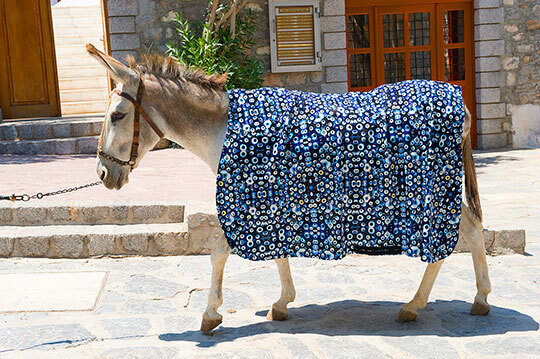 Vassilis Zidianakis participated in the art walk with his work ‘Donkey-e’, a custom-made horse-rug, which was worn by Dusty, the local hard-working donkey.